LexiKAN is a powerful program designed to help you learn to read and write Japanese kanji, hiragana, and katakana. The program contains all 1, 945 Jouyou kanji and more, with support for the KANJIDIC and EDICT files, containing over 6, 000 characters and 100, 000 compounds for use with a searchable dictionary feature and as a source for flashcards. Using the LexiKAN kanji drawing tool, you can practice writing each character with the mouse using a calligraphy-like drawing system that provides stroke-by-stroke feedback on the correct placement and order of your strokes. You can adjust the drawing and feedback options, such as drawing style, stroke-order enforcement, feedback timing, and required precision, in order to tailor the system?s response to your learning style. In the reading flashcard mode, you can practice recognition of kanji characters and compound words using a Multiple Choice or Fill-in-the-Blank ?Quiz Mode?. You can quiz yourself on the Japanese reading or English meaning of each flashcard. Reading and writing practice modes are also available for hiragana and katakana. 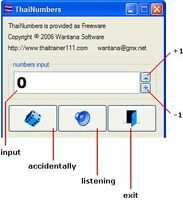 Flashcards are arranged using Word Groups which can be customized manually or generated automatically using the LexiKAN Flashcard Builder tool. 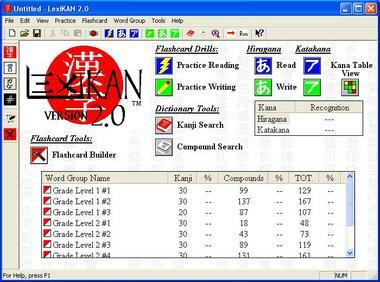 This wizard-style dialog creates Word Groups containing kanji flashcards based on grade level, JLPT kyuu, or one of ten popular kanji reference systems. Using the EDICT database, it also creates compound flashcards containing the kanji in each Word Group, resulting in a customized syllabus of both kanji and related vocabulary. 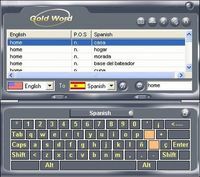 For manually created, user-defined Word Groups, the same feature can be used to add compound vocabulary. With the Kanji Search feature, you can look up characters by on/kun reading, English meaning, or even using character recognition. With Compound Search, you can look up Japanese words using reading, English meaning, or kanji characters. Search results can be saved as flashcards for further study and review.